Ojai village settles down into its valley like eggs into a bird's nest, giving credence to some people's contention that its name means "nest" in the Chumash Indian language. Ojai (pronounced like a startled greeting: OH-hi) is situated in a small, east-west valley about 15 miles from Ventura and the Pacific coast, surrounded by citrus groves, oak trees, and the protective Santa Ynez Mountains. You can plan your Ojai day trip or weekend getaway using the resources below. Why Should You Go? Will You Like Ojai? Ojai is a good place for a relaxing getaway or a romantic interlude, with just enough to do at a leisurely pace. If you're a photographer, the oak trees, mountains, and orange groves provide plenty of things to point your lens at. And the annual "pink moment" could be worth planning a trip around. If you don't like to shop, spa, or hike, Ojai may not be for you. Ojai is also a little short on kid-oriented activities to make it a good place for a family getaway. Ojai weather is nice anytime, but hotter in summer. If you go in spring or fall, it will be less crowded, and hotels may offer off-season rates. It is also less busy midweek any time of year. If you've only got a day, take a leisurely stroll along the arcade and the streets branching off from Ojai Avenue (which is also Hwy 150). You'll find art galleries, boutique clothing stores, several places to eat and the tasting rooms for Majestic Oak Winery and Casa Barranca Winery, the first certified organic winery on the Central Coast. Just a block off Ojai Avenue, on the corner of Matilija and Canada, is Bart's Books. Famous for being a (mostly) outdoor bookstore, it's known for its scandalously low-priced specials displayed on shelves along the sidewalk. Those super deals have been sold on the honor system since 1964 when the original Bart first put out a coffee can to collect his earnings when he wasn't around. Bart's Books is open seven days a week. A weekend in Ojai is about escaping and relaxing rather than a big list of things to do. You can't beat the Kuyam experience at Spa Ojai for helping with the relaxing part. It uses the therapeutic effects of cleansing mud, dry heat, inhalation therapy, and guided meditation. You can get a day pass at the Oaks at Ojai to enjoy their fitness program and spa or try Day Spa of Ojai which offers massage, facials, and body treatments. Visitors give high marks to Ojai Olive Oil at 1811 Ladera Road for their tours and products. For a little more active day, you can go horseback riding with Western Trail Rides. If you have kids Ojai Trail Riding company offers special programs just for youngsters. Rent a bicycle from Bicycles of Ojai (108 Canada Street) and pedal the 16-mile paved path that runs from Ojai's Libbey Park all the way to the beach in Ventura. At sunset, head to Meditation Mount at 10340 Reeves Road. It's said to be the best place in town to see the "pink moment" at sunset during December and January when the sun strikes the rock face of Topa Bluffs, and a pink glow fills the sky. Check their website before you go: They are closed a few days a week. April: Ojai Pixie Month—a month-long celebration dedicated to the Pixie Tangerine, a tasty citrus orb that is unique to the Ojai Valley. During the month, Ojai businesses, restaurants, and hotels throughout Ojai offer special packages. Whether you're visiting for the day or the weekend, you'll quickly discover that parking along Ojai Ave is limited to 2 hours. Follow S. Montgomery or look behind the arcade shops off E. Matilija for lots with longer limits. They also have a trolley that operates during busy times. Check their maps for stops and prices. If you need to "go" while you're downtown, head for the green-tiled arch under the arcade. Follow the signs pointing toward more shops. There are public restrooms back there. We haven't had the time to stay in every hotel, motel, B&B and other lodgings in town, but we would go back to the lovely Su Nido Inn anytime and we still remember how nice it was to find the hot tub ready for us to jump into a chilly evening. If you'd like to get away from your daily stress, get some exercise or take a few yoga classes, you can do it all at the Oaks at Ojai, where meals and all classes are included in their daily rate. For a unique lodging experience, try Caravan Outpost, a collection of vintage Airstream travel trailers circled around a central area where you can get to know your fellow travelers. For other ideas, go to Tripadvisor for reviews and price comparisons on hotels in Ojai. If you're looking for a place to camp, you'll find 400 sites along the shores at Lake Casitas, just a few miles out of town. Ojai is 83 miles from Los Angeles, 207 miles from San Diego and 120 miles from Bakersfield. From the north or south, take US 101 to CA Hwy 33 east. The junction is just north of Ventura. 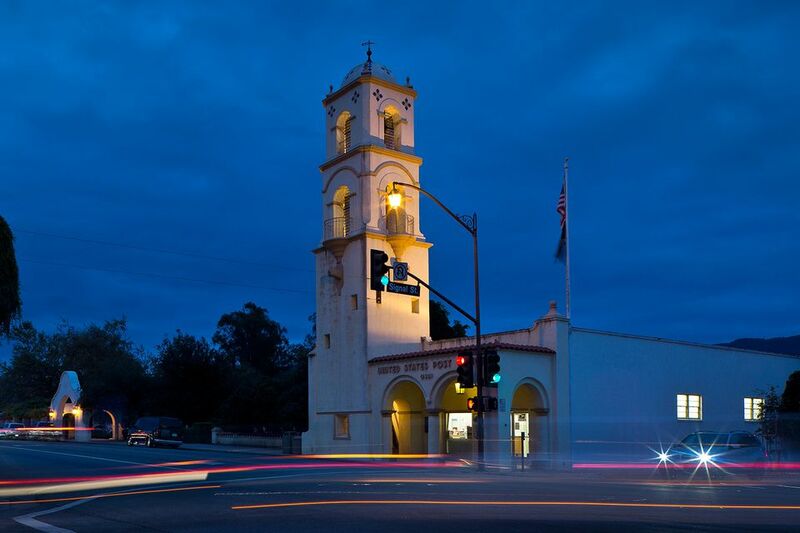 If you're driving southward on US 101 at night, resist the urge to turn off at Hwy 150 (which is the first exit you'll encounter toward Ojai). While Hwy 150 is scenic in the day, it's two-laned and winding, no fun in the dark. From the east or central valley, take I-5 to CA Hwy 33 west. You'll likely be done with Ojai after spending a full day there. After breakfast on your second day, think about taking a leisurely drive home. If your home is north of town, CA Hwy 150 toward Santa Barbara includes a scenic drive around Lake Casitas, through pastoral countryside and past avocado groves. From there, you could continue north on Hwy 192, skirting the eastern edge of Santa Barbara, then follow Hwy 154 north through the Santa Ynez Valley, connecting with US 101. If you are going south from Ojai, take CA Hwy 150 int the other direction, and you'll climb to some scenic vista points overlooking the valley on the way to Santa Paula. From there you can take CA Hwy 126 toward Ventura or follow CA Hwy 126 the other way to I-5. CA Hwy 33 leads through the Los Padres National Forest and toward the Central Valley.